On a fall evening some 25 years ago, I walked out the front door of the Brattleboro Museum & Art Center with Emily Mason just as the sun was disappearing in the sky across the plaza, behind the old, one-story Brattleboro Co-op. She stood still and gazed with a rapt expression on her upturned face and remarked with wonder in her voice, "Oh, the lavender!" I stared at a sky streaked with gold, pink, and blue and thought, what is she seeing? Glancing at the buildings on Main Street, I saw golden light striking the bricks and deep maroon shadows, but no lavender. Nor was there any in the recesses of the yellow-toned Latchis Hotel and Theatre. As my eyes darted around the scene, the voice in my head kept asking, where is the lavender? Then, slowly it bloomed in the subtly tinted air between the sky and our faces—lavender. Mason taught my eyes to see something I was unable to see. Her paintings do the same. In her childhood Mason attended the openings of the American Abstract Artists with her mother, Alice Trumbull Mason, a founding member of the group. She even remembers seeing Mondrian at one of their early shows. Later on, when her mother was working at Atelier 17, a print workshop on East Eighth Street, Mason had the opportunity to make an etching of her own, which was used to illustrate a small book about a girl who escapes from Europe. Mason spent the summer of 1952 at the Haystack Mountain School of Crafts in Maine, where she attended a pivotal lecture on analogous color by renowned textile designer Jack Lenor Larsen. While studying at the Accademia di Belle Arti in Venice on a Fulbright scholarship in 1956 she learned new techniques of applying paint, such as blotting and transferring. 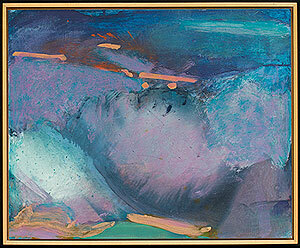 To Another Place includes works from this formative period in Mason's career and the six decades that have followed. Emily Mason's work, by virtue of her birth and training, is deeply rooted in the world of abstract painting that eschews depictions of nature and illusionistic space. Rather, it is art grounded in paint and the act of painting. In the documentary Emily Mason: A Painting Experience by RAVA Films, Mason articulates her artistic process: "I always begin a painting with a blank canvas and not any preconceived idea of what it's going to look like. I just sort of react. I can't predict it, so I let the materials suggest the next step and then take it from there." 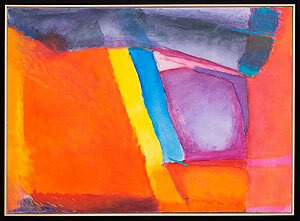 Her working method is fundamentally a call-and-response to paint and color—an ongoing dialogue of discovery. "It's a process of letting a painting talk to you.... I want painting to take me to a place I've never been." Mason revels in the beauty of paint itself. She explores and exploits its materiality, pushing technique to the edge. 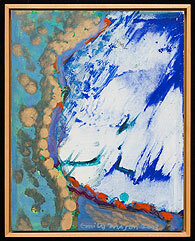 Many of her paintings begin with a pour of paint, a chance action that places one color on a white ground. The shifting directions of the drip lines provide evidence of how the artist manipulates both paint and surface. 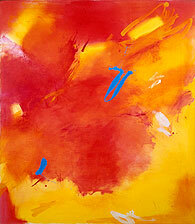 She also deploys open, energetic brushwork and expressive mark making. Passages of paint vary, ranging from opaque pools to gossamer veils. Viewing her work is not only a visual experience but also a visceral one. Without touching the paintings, we understand and respond to their tactility. To Another Place traces the artistic arc of a career. What you will encounter is a remarkable constancy of vision supported by an increasingly nuanced mastery of paint and form. Emily Mason's most recent paintings are dynamic visual symphonies. Evoking rather than describing, they move us physically, emotionally, and spiritually with their interplay of colors, their coalescing forms, and their shifting intensities, densities, and fusions. Contemplating Mason's work is much like watching a storm, or a sunrise or sunset. I invite you to be taken to another place by the paintings in the galleries. And, as you walk out the front door, I hope you will encounter lavender hanging in the air. NOTE: Emily Mason will give an ARTIST TALK about her work on Friday, October 19, at 7 p.m. in the gallery.